Resume: “1. a summing up; a summary. It is oftentimes easy to agree or assent intellectually to God’s greatness during a season of personal comfort, success, and happiness. The greatness of God can be more of an idea during these times, a concept we acknowledge in passing if not consciously think about. But it is during the seasons of discomfort, failure, and suffering where we can realize that the greatness of God is not a fleeting notion but rather an ever-present reality, that God’s greatness can be not only thought about but also leaned upon. So where are you today? Can you even think about—let alone see—God’s greatness in your situation? Has the whipping wind of today’s tempest drowned out your ability to hear about God’s faithfulness? Has the blistering heat of your trial burned you raw to God’s soothing presence? Has your starved spirit lost its taste, its hunger, for God’s flavor? Has the stinging sand storm of your predicament blinded you to God’s promises? Has the coldness of your conflict numbed you to God’s warm embrace? God is great…but is He still great now? For you? In your storm? Job wrestled with this very issue—whether God’s greatness is constant or is affected by outside circumstances. Job suffered immensely—losing his health, wealth, and children—and his idea of God was assaulted by the reality of his situation. After questioning God, deliberating with friends, and attempting to reason his way to an understanding of God’s greatness in light of his experience, God speaks from center-stage and “answers Job out of the storm.” But God doesn’t respond to Job with answers to his questions or an explanation to his suffering; rather, God shifts Job’s attention from all that is happening to him to all that God has done in creating the universe. 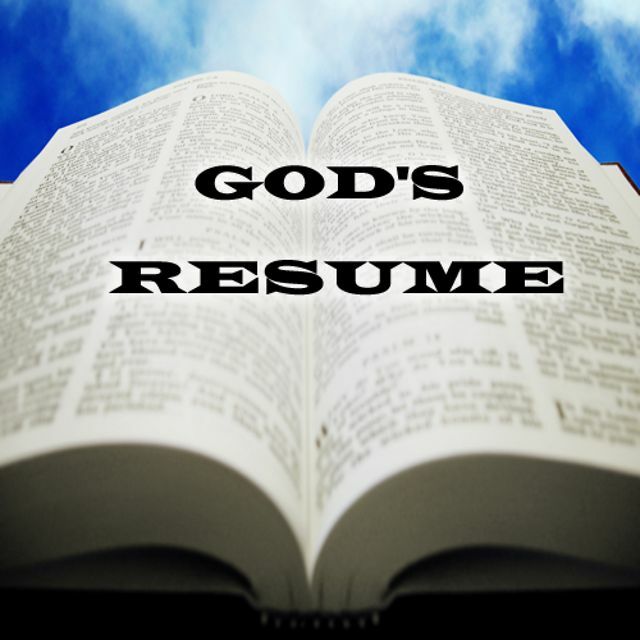 You see, God moves Job’s eyes to God’s resume & credentials—to an abridged summary of His experience, to exhibit A of the evidence for God’s qualifications to be in control of our lives. If God can be trusted to effectively create the universe (without our expert input! ), then we can trust Him to guide us through the avenues of our temporary earthly existence (without us completely understanding every turn, pit-stop, break-down, red light, fender-bender, and ten-car pile up). My friends, the greatness of God is not merely a mist in our minds that disappears with the morning. No, God’s greatness can be a rock that we stand upon, a beam that supports us, a structure that shelters us, and a faithful companion who goes with us. Let us strengthen the muscles of our faith in God by reading God’s Word—the Bible—to remind ourselves over and over again of God’s impeccable resume and unmatched credentials to be Great, and to be Great for us…before, after, and during our storms.